It’s not exactly news that CFOs as a group aren’t satisfied with the quality of their financial planning and analysis functions. That’s been the case for some time. But with investments in FP&A rising as more data becomes available and companies seek to unlock its potential value with top-notch analysis, continuing quality issues are translating to doubt as to whether the investments are wise. That’s according to new findings from CEB, the corporate research and advisory firm. Drawing from several empirical studies and qualitative interactions with CFOs and FP&A directors, the firm makes a case that the way a large majority of companies go about FP&A is all wrong. Building a modern FP&A operation is expensive. It requires investments in systems, data, people, and new functions and processes — and the spending might not slow down for some time as the team finds more things to do with data. In fact, one recent CEB study of 99 companies shows that spend on analytics is up 10% this year over 2014. Still, frustration over analytics performance is on the rise too, says Johanna Robinson, a practice leader in the firm’s corporate finance practice. Misuse of FP&A is rampant. According to a 2015 survey of 2,305 business decision makers (vice presidents and above), they don’t use financial analytics at all for 25% of decisions with financial implications, often because they distrust the available analyses. “Financial analysis as it currently stands, or at least how it’s executed at most companies, can actually hurt decision-making,” says Robinson. Perhaps worse, according to FP&A directors, 635 of whom were surveyed, 61% of the time decision makers selectively choose analytics that validate their gut instinct — what they would have done if no analysis had been performed. Such results may appear to suggest FP&A underperformance could be blamed partly on cultural issues, but CEB’s research finds otherwise. Regression and relative-weight analyses of responses to numerous, often repetitive, and sometimes disguised survey questions — aimed at isolating the causes of financial-information misuse — demonstrate that only 1% of the blame is attributable to organizational characteristics like who gets to make decisions and whether the company allows decisions to be made on the fly. The biggest share of the problem, 51%, lies with finance itself. That divides into 30% for quality of analysis (its timeliness, accuracy, comprehensiveness, volume of detail, and actionability) and 21% for access to data. Not all companies suffer from poor financial analysis. Using data from the survey of 2,305 decision makers, CEB groups companies’ FP&A prowess into quartiles. The research results generate a quality index in which the monetary value of decisions informed by financial analysis at bottom-quartile companies is x. For companies in the top quartile, that value is 2.3x. 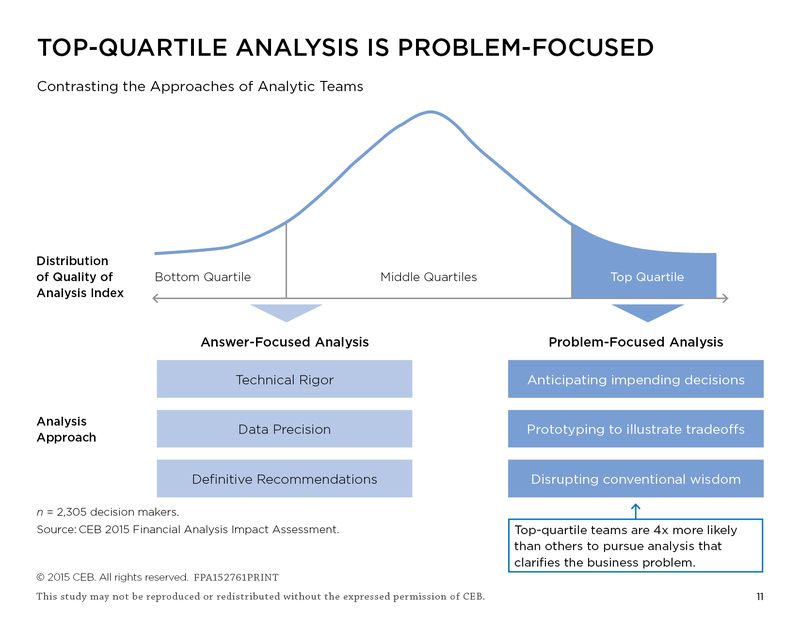 Amazingly, middle-quality analysis — performed at companies in the second and third quartiles — is valued at just 1.1x. In other words, average-quality FP&A is virtually no better than poor-quality FP&A. What makes the top-quartile companies stand out? According to CEB, it’s a matter of focus. Poor-quality and average FP&A seeks to provide definitive answers to specific questions. Counter-intuitively, poor analysis is marked by such seemingly admirable traits as technical rigor and data precision (see graph, below; click on it to make it larger). Good analysis, by contrast, is problem-focused. It anticipates decisions that will need to be made, illustrates trade-offs, and disrupts conventional wisdom. “Instead of answering a question someone asked, problem-focused analysis is designed to clarify the question, bring a new lens to it, and get people thinking differently,” says Robinson. Exemplifying the difference between the two approaches, say the finance team is asked, “What was our deviation from sales performance targets this quarter?” Answer-focused analysis might say, “Minus 5.62%.” Problem-focused analysis might baseline the number relative to historical variance, but more importantly, identify root causes of the drivers of sales variance and assess which ones are controllable. Or if the question is, “Should we fund this investment?” answer-focused analysis might say, “ROI is 17.1%, or 4.1% above the hurdle rate, so yes!” Problem-focused analysis might, for example, detail operational uncertainties that could cause the project to be poorly positioned entering its maturity year. Get the business to think of what could go wrong early. “Finance can actually change its approach to FP&A to improve quickly and see greater return on investment,” says Robinson. Just because finance people spent weeks on crunching numbers doesn’t make their output is anyhow relevant to decison making process, which is more complicated than bunch of formulas they’ve compiled.